Caption Play Faire Productions is proud to announce that we will once again be returning to an English Village for our Harvest time Faire. The time will be set in the Renaissance with some liberties taken to expand from as early as the 1490s to 1630s. This opens us up to a wider array of characters and still gets the point of the era across. We will welcome back our beloved Queen Elizabeth I and her beautiful court. We are stretching our imaginations to incorporate some of the lively characters that were in full blossom before or after her reign. As our exotic Traders Market visits our little shire we will open the door to more international characters and costumes. Although we rely on our English foundation when it comes to such favorites as our witty Washer Women our tireless Mongers our relentless Puritans our colorful Fools our crooked Constables and our beloved peasants from St Cuthbert's and other guilds we want to open the door for more international visitors as well. 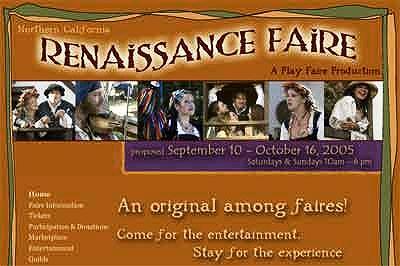 Headline SEP-OCT: Northern California Ren Faire.